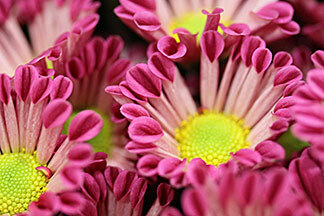 Would you care for a little tour around the colourful world of chrysanthemums? Click on the headlines that interest you. And then ... happy reading! As autumn approaches they reappear: exuberant chrysanthemums in an unbelievable variety of colours. Originally from Asia, they became the centre of attention there a very long time ago. In China, for example, where the composite-flowered plant was cultivated as early as the 15th century BC and rose to become a favourite with the mandarins. 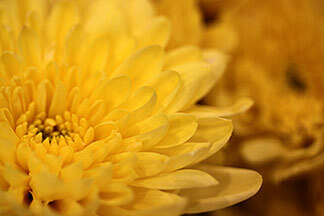 Early chrysanthemums were only available in yellow. 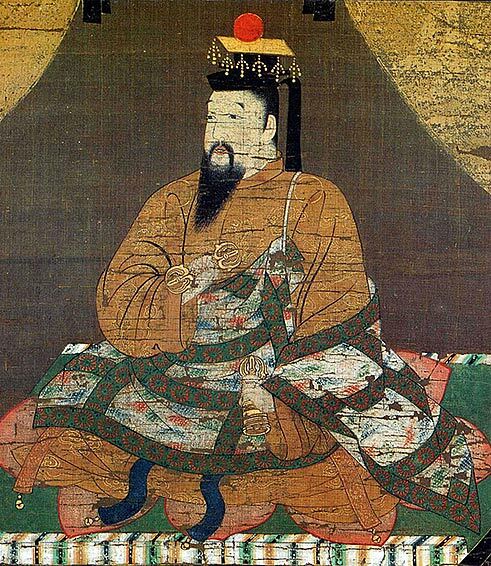 From China they came to Japan, where they delighted the Emperor. For centuries, he was the only person permitted to own and cultivate them. The cultivation of chrysanthemums reached its zenith in Japan in the 16th century, and every known variety bloomed in the Imperial garden up to the start of the First World War. French voyager Pierre Blancard brought the first three species to Europe in 1789. Only one, with a red flower, has survived. Luckily, Scottish gardener Robert Fortune managed to transport a whole range of different chrysanthemums from China to the UK in 1843. From there, the flower conquered first America, and then the rest of Europe. 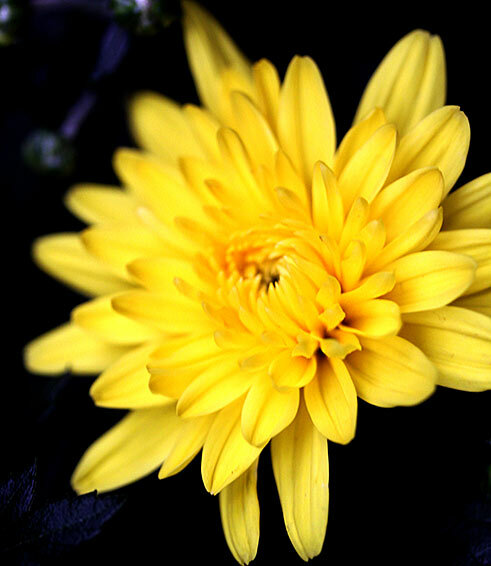 The name "chrysanthemum" is composed of the Greek word "chrysos", which means "gold", and "anthemon", meaning "flower" and therefore means "golden flower". 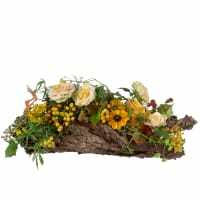 You'll find our autumn inspirations HERE. Chrysanthemums are like Indian Summers: colourful and beautiful. In every colour from white through yellow, green, orange and copper to red, rose-colour, pink and wine-red, they are sure to lift anyone's spirits even on the gloomiest day. The blossoms vary as well. 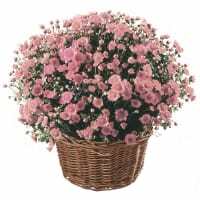 There are large, tiny, single, semi-double and double flowers, not to mention the pompom, spider and anemone varieties. The names are exciting as well. Some of them refer to the colour of the blossom, such as 'Goldmarie' (golden yellow), 'Klein Bernstein' (literally 'little amber', an apricot shade) or 'White Bouquet' (white). However, there are also names that sound so romantic that the name alone makes you want a closer look at the flower behind it. For example, the silver-rose coloured 'Nebelrose' ('misty rose'), that radiates grace and elegance with its beautifully formed, large blossom, or the 'Lachsrote Wolke' ('salmon-pink cloud'), whose muted red blooms continue to flourish into November. 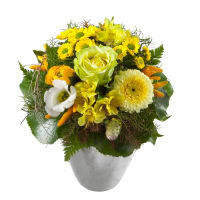 In short: visit your florist or garden centre, take a look around. 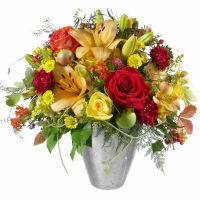 Then take home the splash of colour that symbolises this wonderfully vibrant season for you. Because, as the Czech writer Pavel Kosorin so aptly put it: "Autumn is the season in which nature turns the page". 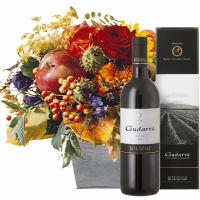 You'd like a splash of autumn colour? The shop is HERE. 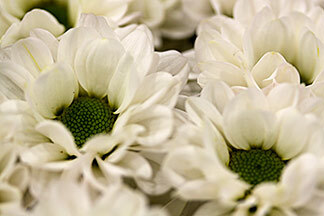 It's no wonder that chrysanthemums symbolise long life. 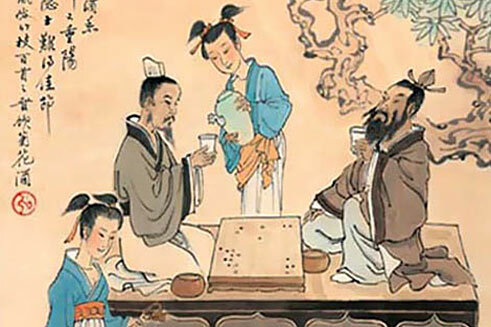 The Chinese discovered their medicinal properties early on. Even today, dried or smoked Hang Bai chrysanthemum flowers are used to make teas that are thought to have an anti-microbial and anti-inflammatory effect and to dilate the blood vessels. They are also rich in vitamin C, which is ideal for preventing colds. In China, Korea and Japan chrysanthemum leaves are even eaten as a salad, while the flowers are used in Korea for sandwiches and in cake. 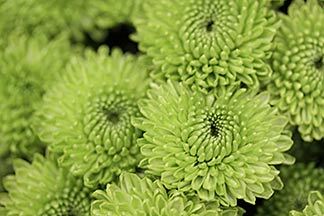 But take care: although many species of chrysanthemums are edible and suitable for use as plate decorations, this does not apply to tanacetum species. Therefore, special edible or salad chrysanthemums (Chrysanthemum coronarium) are available for sale which can be grown almost anywhere. If you harvest them young, the leaves can be used in mixed salads. Later on they can be prepared like spinach. Buds and flower heads can be blanched, deep-fried in batter or simply used for decoration. If their unique flavour doesn't appeal to you however, you can grow this pretty plant simply for decoration. 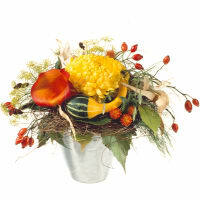 You prefer flowers for decoration? You'll find our best suggestions HERE. 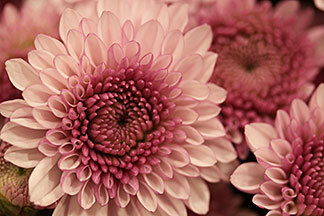 The chrysanthemum is so popular to this day in China, its country of origin, that a public holiday is devoted to it. It's called the Double Ninth Festival and has an interesting history behind it. Once upon a time, there lived in the River Nu an evil demon which brought disaster on everyone. 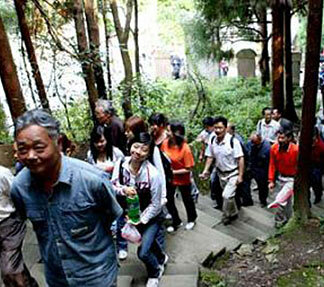 It also killed the parents of young Heng Jing, who then set out on a journey. He wanted to free people of this monster, and therefore sought an immortal who would train him in the art of sword-fighting. He succeeded. 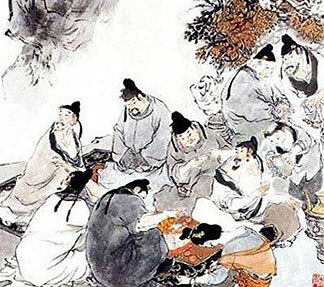 And so, on the morning of the 9th day of the ninth lunar month, Heng Jing sent all the people of the village up the nearest mountain with a branch of dogwood and chrysanthemum wine. Why? Well, because evil spirits cannot climb, chrysanthemums represent courage and longevity and nine is a lucky number in China. 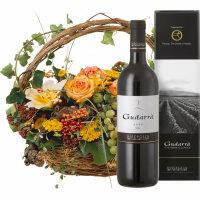 So when the demon rose out of the water, it became intoxicated from the scent of the branches and the aroma of the wine. 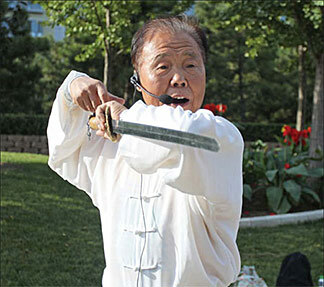 Heng Jing took advantage of this moment, drew his sword and won the fight. Since then, this "event" is re-enacted in China on the 9th day of the 9th lunar month. The Chinese climb up hills and mountains, admire the blossoming chrysanthemums on the way and then drink delicious chrysanthemum wine on arrival. 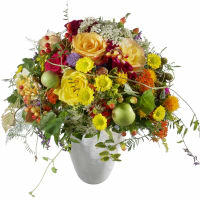 Late summer flowers also play an important role for us. HERE. In Japan, the chrysanthemum has been a real success story. 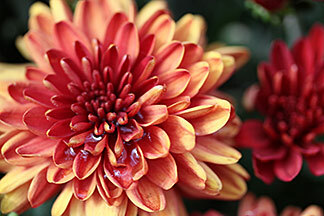 Because the Japanese Emperor is thought to be descended from the sun goddess Amaterasu and chrysanthemums resemble miniature suns, the name "kiku", or "sun", was conferred on them, and they were elevated to the status of Japan's national flower. The palace became the Chrysanthemum Palace and the throne became the Chrysanthemum Throne accordingly. In addition, the Japanese created a stylised chrysanthemum design with 16 petals, which they used in the Imperial coat of arms and the highest Japanese honour – the Order of the Chrysanthemum. There's also a Chrysanthemum Festival. For many years it was celebrated on the 9th day of the 9th lunar month purely as a court ceremonial. However, from the 17th century onwards, chrysanthemums and the Chrysanthemum Throne were so beloved that the occasion became a public festival. It is still celebrated today. 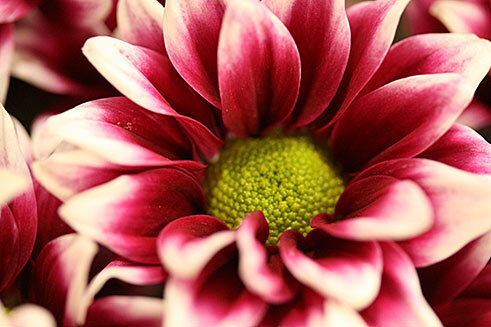 It takes place on 9 September and is accompanied by magnificent chrysanthemum displays. Would you like an Indian Summer Festival of your own? Go to our suggestions: HERE. Wonderful chrysanthemums caught people’s imagination right from the very beginning. For this reason, they were associated with positive symbolism. In China, for example, they stood for courage because they "dared to blossom" in the chilly autumn. At the same time, however, they also symbolised resilience, long life, nobility, reflection, modesty, eternal love and joy. This led to the frequent occurrence of chrysanthemums not only in Chinese lyric poems, but also on splendid robes for special occasions. In Japan, they became the symbolic flower of the Emperor, and therefore an emblem of immortality and perfection. In the 17th century, this led to people placing the flower in their hair to protect them against evil at the Chrysanthemum Festival, which was celebrated with great pomp and ceremony. In Europe, the garden chrysanthemum only achieved symbolic significance in France. It seems likely that the French were copying the Chinese here. You see, in France chrysanthemums mean "love beyond death", which is very reminiscent of their Chinese meaning of "eternal love". You will find chrysanthemums and other positive symbols HERE.